The characteristic of water-resistance can often be a deciding factor when choosing a wearable device. However, if anyone tells you a watch or fitness tracker is fully waterproof, its a lie. Because at a certain level of water pressure, every wearable will begin to leak. This is why regulation prohibits wearables to be marked as waterproof. Such a thing doesn’t exist. Much confusion remains regarding the various degrees of water-resistancy. Are you safe using your fitness device in the shower or in the rain? Will the device continue to function if you go into the swimming pool with it? In this article we try and shed some light on the matter. The first thing you need to do is check your device’s ISO rating. ISO has developed a standard providing test methods and labelling features for watches and fitness wearables sold as “water-resistant”. The new international standard puts onus on manufacturers to prove their devices are water-resistant against criteria of industry best practice and international know-how. The ISO rating can often be found on the back of wrist watches or fitness devices to indicate how well the device is sealed against ingress of water. It is usually accompanied by an indication of the static test pressure that a sample of newly manufactured wearables were exposed to in a leakage test. The test pressure can be indicated either directly in bars, or (more commonly) as an equivalent water depth in meters (in the United States sometimes also in feet). An indication of the test pressure in terms of water depth does not mean that the wearable was designed for use in such water depths. For example, a fitness device marked at 30 meters depth cannot be expected to function at 30 meters under water. This is because the test is conducted only once using static pressure on a newly manufactured wearable. In practical use, a device is subjected to variations in pressure which can add to the static pressure of the water. Examples of this include the movement of a swimmer’s arm through the water, or violent sprays encountered in water skiing. This means that tests include safety margins to take factors in account like aging of the seals, rapidly changing water pressure and temperature, as well as dynamic mechanical stresses. Also, resistance testing is performed in fresh water. So unless explicitly specified by the manufacturer, devices are not guaranteed to hold under salt water. ATM or 1 BAR (10m or 33 ft) Improved resistance to rain and splashes. No showering or swimming. 3 ATM or 3 BAR (30 m or 100 ft) Everyday use, it can withstand a gentle splash such as rain but is not suitable for swimming. 5 ATM or 5 BAR (50 m or 165 ft) Everyday use and swimming, splash in pool but not suitable for pool side diving or water sports. 10 ATM or 10 BAR (100 m or 330 ft) Everyday use, poolside diving and snorkelling. Not suitable for high board diving, high impact or water sports. 15 ATM or 15 BAR (150 m or 500 ft) Everyday use, poolside diving and snorkelling, most water sports. 20 ATM or 20 BAR (200 m or 660 ft) Minimum required for high board diving, high impact water sports or sub aqua diving. 100 ATM or 100 BAR (1000 m or 3300 ft) Minimum required for professional deep sea diving. Fitness devices also sometimes provide an IP rating. 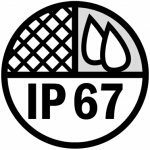 The IP Code (or International Protection Rating, sometimes also interpreted as Ingress Protection Rating), consists of the letters IP followed by two digits and an optional letter. As defined in international standard IEC 60529, IP classifies degrees of protection provided against the intrusion of solid objects (including body parts like hands and fingers), dust, accidental contact, and water in electrical enclosures. Level 1: >50mm Any large surface of the body, such as the back of the hand, but no protection against deliberate contact with a body part. Level 2: >12.5mm Fingers or similar objects. Level 3: >2.5mm Tools, thick wires, etc. Level 4: >1mm Most wires, screws, etc. Level 5: Dust Protected Ingress of dust is not entirely prevented, but it must not enter in sufficient quantity to interfere with the satisfactory operation of the equipment; complete protection against contact. Level 6 Dust Tight No ingress of dust; complete protection against contact. Level 1: Dripping water Dripping water (vertically falling drops) shall have no harmful effect. Level 2: Dripping water when tilted up to 15° Vertically dripping water shall have no harmful effect when the enclosure is tilted at an angle up to 15° from its normal position. Level 3: Spraying water Water falling as a spray at any angle up to 60° from the vertical shall have no harmful effect. Level 4: Splashing water Water splashing against the enclosure from any direction shall have no harmful effect. Level 5: Water jets Water projected by a nozzle (6.3mm) against enclosure from any direction shall have no harmful effects. Level 6: Powerful water jets Water projected in powerful jets (12.5mm nozzle) against the enclosure from any direction shall have no harmful effects. Level 7: Immersion up to 1m Ingress of water in harmful quantity shall not be possible when the enclosure is immersed in water under defined conditions of pressure and time (up to 1 m of submersion). Level 8: Immersion beyond 1m The equipment is suitable for continuous immersion in water under conditions which shall be specified by the manufacturer. Normally, this will mean that the equipment is hermetically sealed. However, with certain types of equipment, it can mean that water can enter but only in such a manner that it produces no harmful effects. So remember, there are no waterproof wearables. And make sure to always check the markings on your device or the manufacturers website before taking a wearable into the shower or pool.